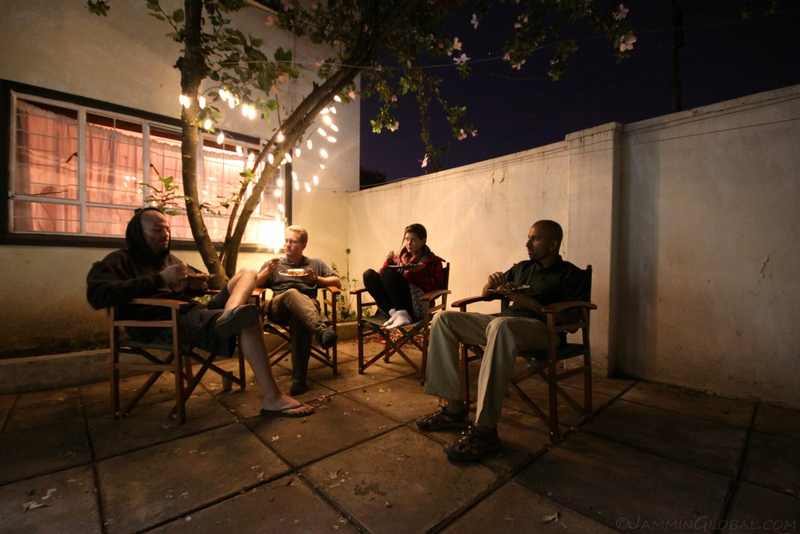 When I left Chicago at the start of this trip, I had a vague idea of taking a long break somewhere in Africa. Besides a desire of getting to know one place really well, in contrast to my transience while on the road, I needed this break to conduct research for the distance masters that I’m studying for while traveling. I’m pursuing a Masters of Science in Sustainable Development from SOAS in London and as it’s a distance program, I just study for the courses on my laptop and take the yearly exams at a British Council. 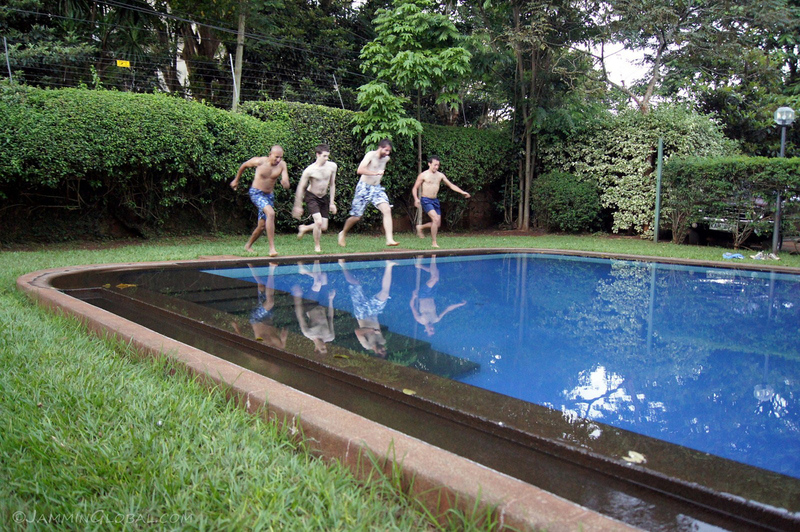 My first year exams were in Sao Paulo and my second year exams were done in Nairobi. The third and final year of this program consists of a research thesis and it can be done on a wide range of topics that fall under Sustainable Development. My interest is in Natural Resource Management and I was searching for a place to conduct research in this topic. Two weeks before arriving in Kenya, my father came through with a contact at ICRISAT-Nairobi who was looking for a masters research student. My research at ICRISAT (the International Crop Research Institute for the Semi-Arid Tropics) would be on gender and agricultural water management. I spent my first few months in Nairobi focusing on my coursework and exams and putting together my research proposal. Field work was scheduled to begin in January, 2012. Having settled on my professional duties for my break in Kenya, I set about temporarily settling down my personal life. After being on the road for a year and a half and living minimally during that time (1 pair of cargo pants, 4 t-shirts, sandals), I began to acquire stuff. But, since I knew I would be disposing of this ‘stuff’ when my time was up in Kenya, I acquired all of it second-hand: used jeans for $6, used sneakers for $5, etc. I made many new friends during my travel from Chicago to Nairobi and while I cherish my solitude, I was looking forward to a more regular social life during this break. 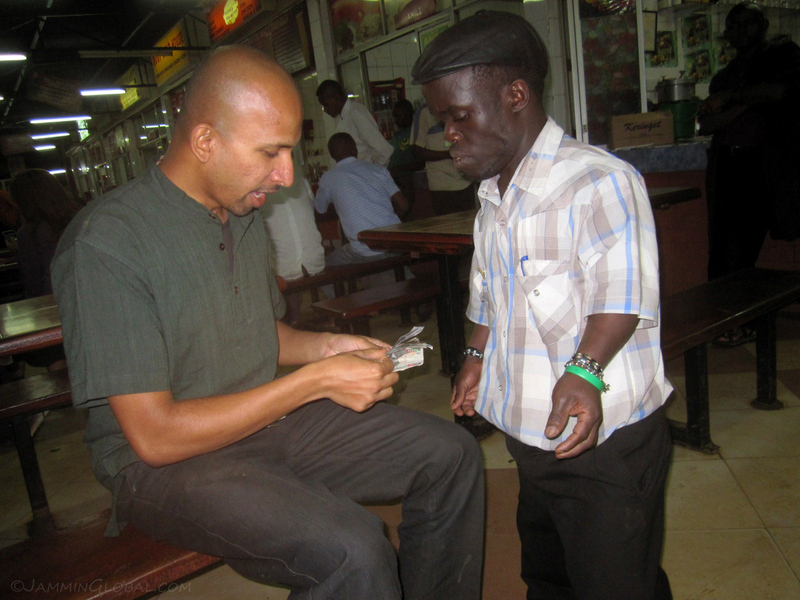 I met lots of interesting people in Nairobi and a few of them have become very close friends now. If you’ve been following the journey, you know that food is close to my heart and I was looking forward to cooking on a regular basis again. Soon after my arrival in Nairobi, I hosted a couple of dinner parties where I served up my chicken curry and met my new friends. 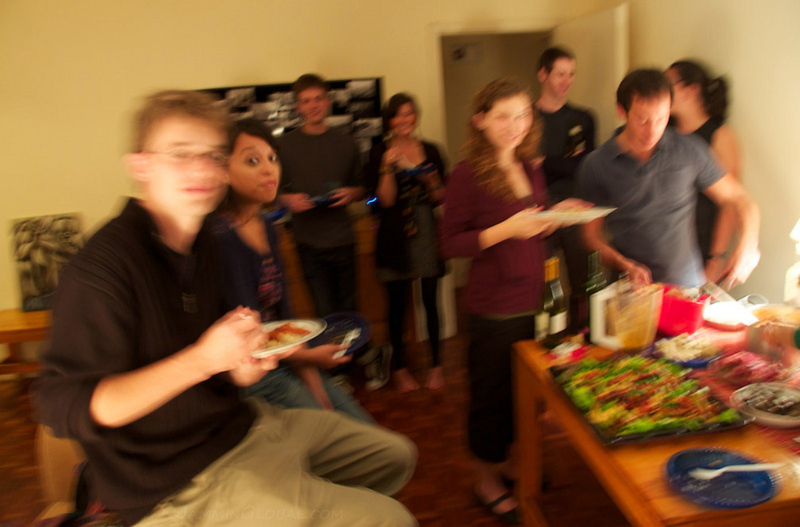 My circle of friends developed into an idea called Food without Borders where members take turns in hosting and cooking some food from their home country. A simple, but rich concept. Following are select photos from my first few months in Nairobi. Karibu (welcome). 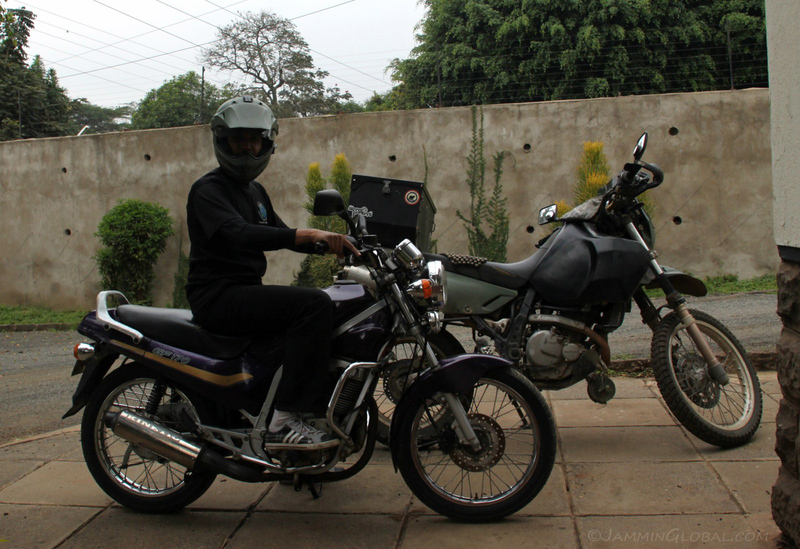 Soon after settling down in Nairobi for my extended break, I began to acquire stuff, such as a pair of used jeans, some used sneakers and… a little motorcycle for city riding. sanDRina was running just fine on the open savannahs but she doesn’t like riding in traffic. Plus, city riding, with its frequent braking and accelerating, would cause unnecessary wear on this world-traveling motorcycle. With help from a friend at the research institute, I was put in touch with some local mechanics who knew of this bike for sale. It’s a Kinetic GF 170, an Indian bike with a Korean engine from Hyosung. The bike had pep, disc brakes and a styling purple livery. Her name is Lara. 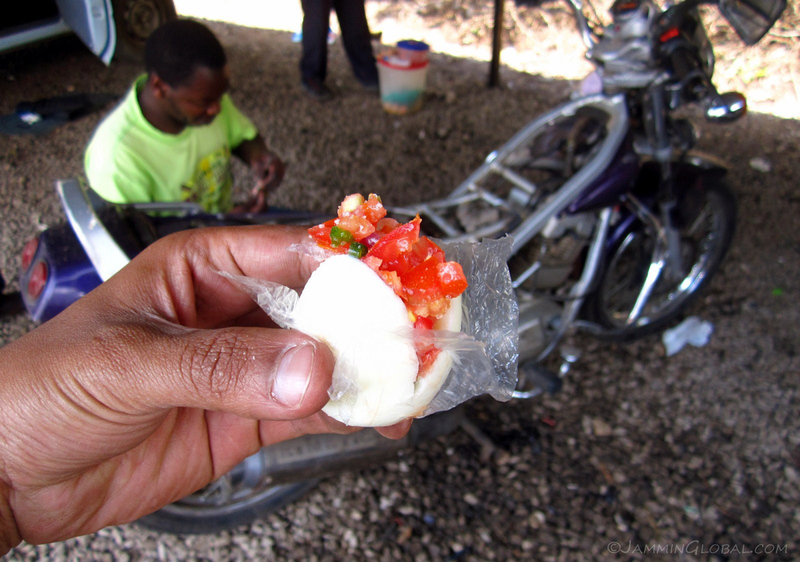 Having a snack of a boiled egg with kachumbari (salsa) for Ksh15 ($0.16) while Ken, a mechanic friend, did a servicing on Lara (new oil, plugs, etc.). Having dinner on the patio at the place I was staying at. I made a stir-fry of brinjal (egg plant) with cauliflower and some smoked masala that I bought in Argentina. 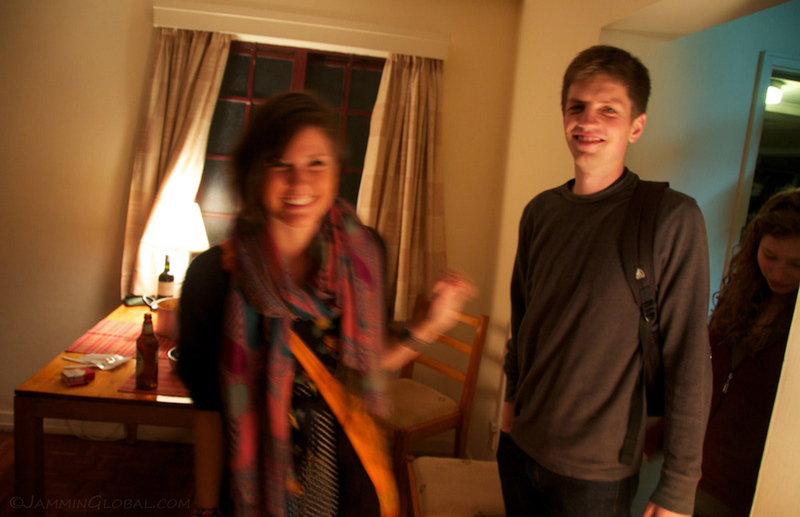 Brian, on the left, was also living in the same house and is a freelance journalist from the American East Coast. Before coming to Nairobi, he was based in Cairo and was reporting from the front lines during the height of the Libyan conflict in 2011. He regaled us with stories such as taking a medical supply ship into Misrata. Next to him is Randy, from Vancouver, whom I met in Ethiopia and got in touch with once he got here. He’s very out going and met Dani in a shopping mall just because she had a Canadian flag on her backpack. Dani later introduced me to her circle of friends. I found the place I was staying at through CouchSurfing and my host, Patricia (from Michigan) was kind enough to let me stay for free for the first three months; thereafter I paid a modest rent. 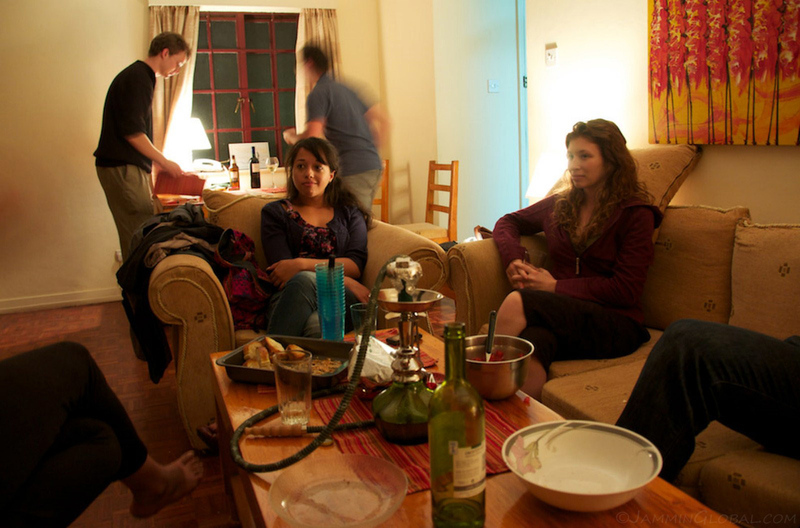 To give back to CouchSurfing and help build the network in Nairobi, I hosted a CookSurfing event, which is a basically a dinner party where CouchSurfing members contribute and get to know each other. 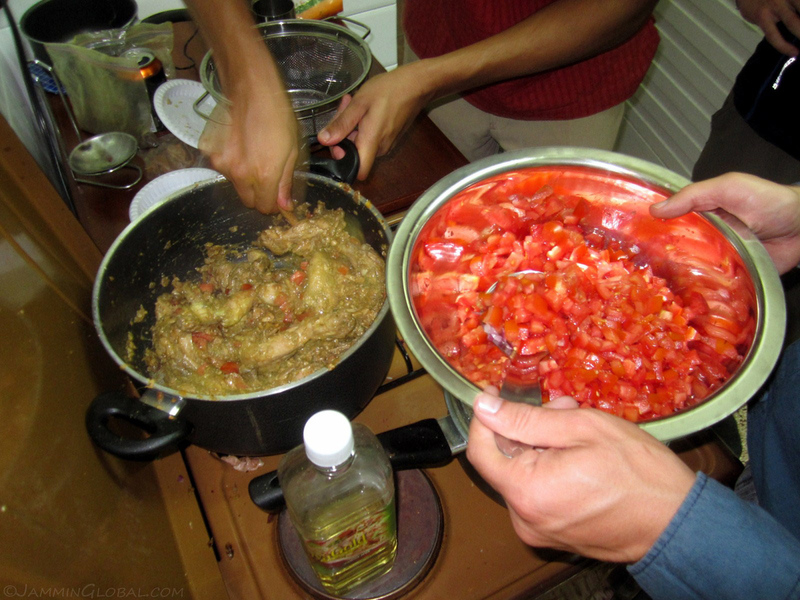 Here, I’m mixing in the tomatoes for the last stage in my chicken curry. Dinner patrons contributing to the CookSurfing dinner by washing all the dishes. It’s good to be the cook. 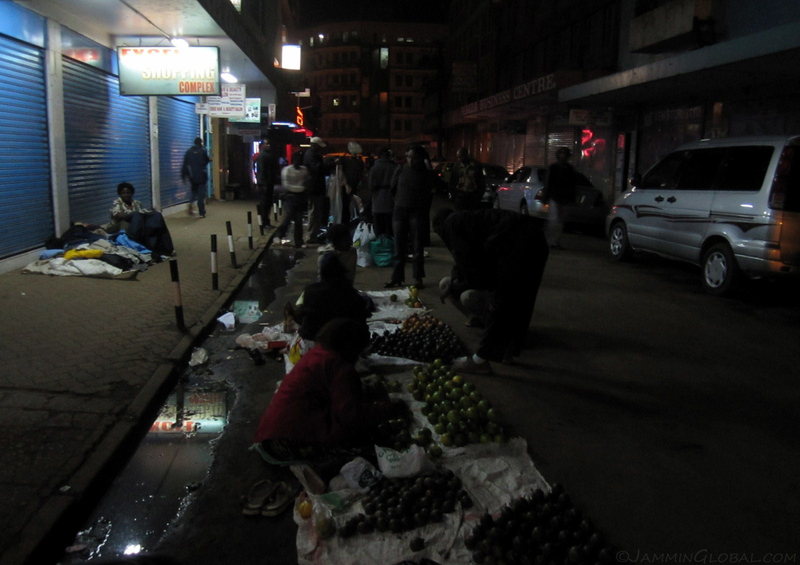 Randy was staying in a cheap hotel in downtown Nairobi and this was the scene outside his hotel – a late-night fruit market. 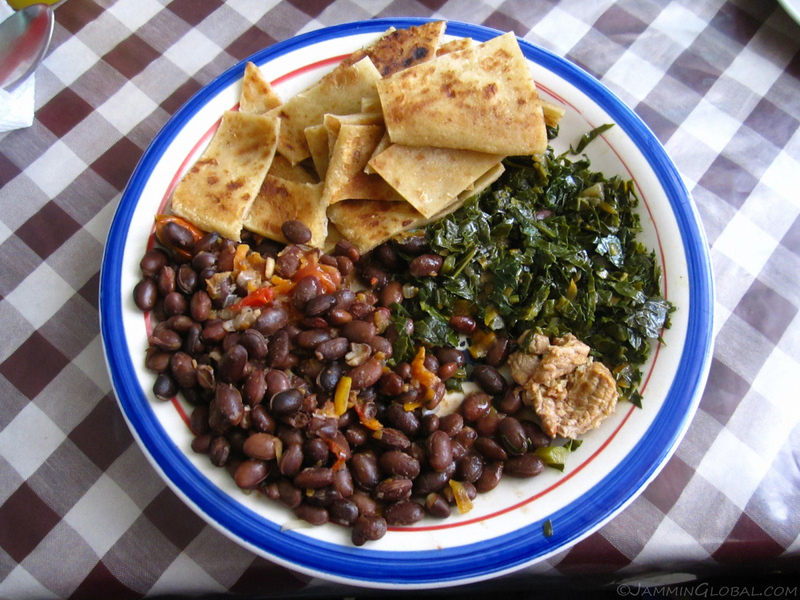 Enjoying an almost-vegetarian Kenyan meal of njahi (black beans), cut-up chapati, sukuma wiki (stir-fried kale) and a small piece of meat. Most Kenyans can’t eat a meal without the taste of meat. Sukuma wiki is a Kenyan staple and translates roughly into “push the week,” because for Kenyans who can’t afford meat at every meal and only eat it at the end of the week or on Sundays, they get by during the week by eating lots of sukuma wiki, which is highly nutritious and easily available. 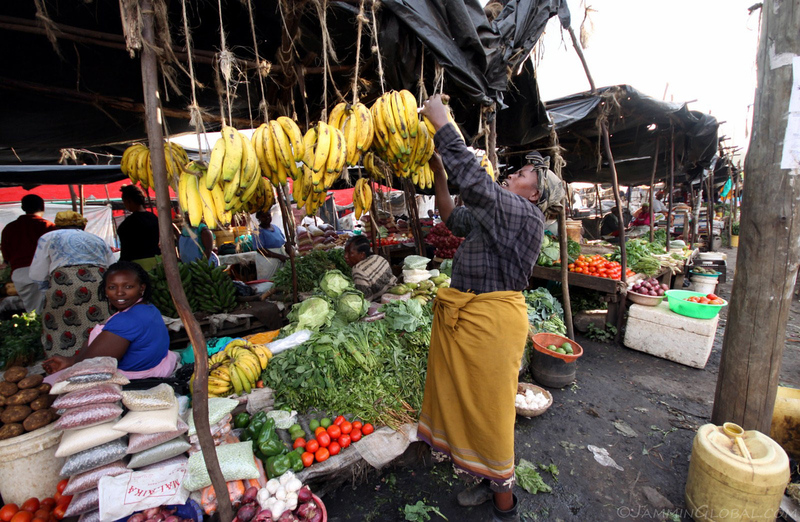 Nairobi is a comfortably-developed city, boasting Wal-Mart-like supermarkets, called Nakumatt, which have similarly poor-tasting vegetables like those found at hypermarkets around the world. I don’t want my vegetables to just look good and be blemish-free, I want them to taste good and for that, I sought out the local markets that are scattered around the city. 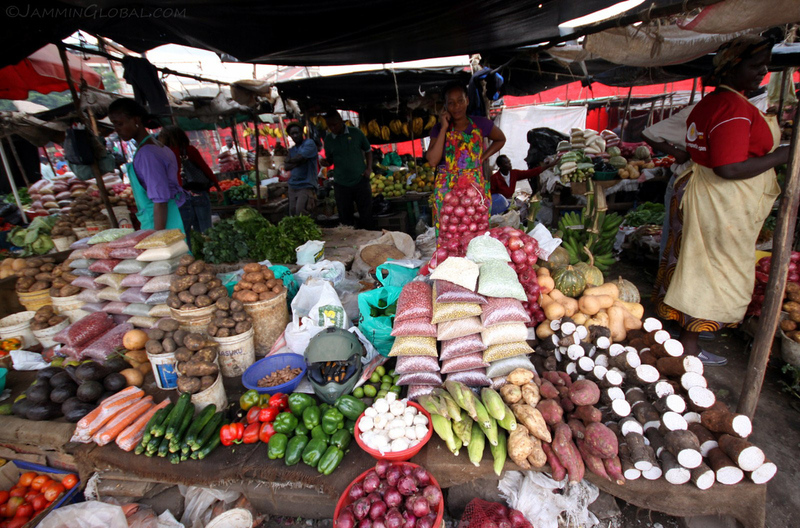 I discovered Kenyatta Market with its better-tasting produce, friendly sellers and cheaper price. I kept coming back to the same stalls every few days to buy just enough produce for a couple meals and developed a nice friendship with these ladies. Brenda, here, was quite lively and always smiling. Spot my helmet. 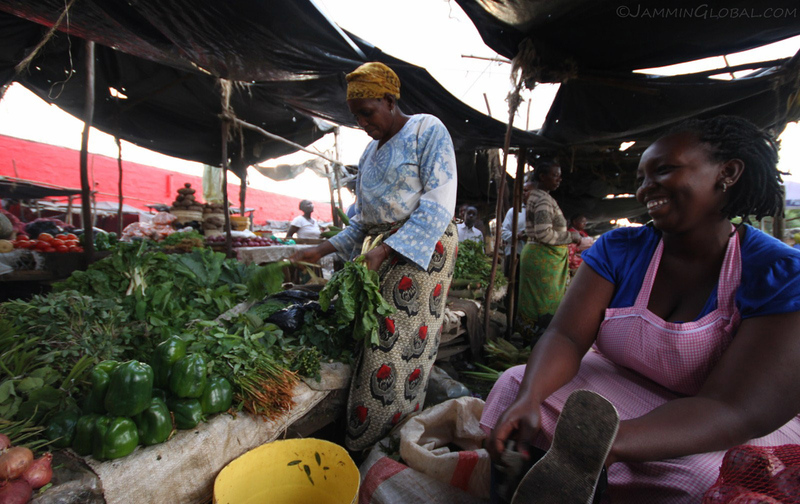 Eva, on the phone, was my main lady at Kenyatta Market. She had most of everything I was usually cooking-up and rounded-down my tally to the nearest 50 or 100 shillings. After a few weeks of repeatedly coming back and developing this friendship, I asked them if I could bring my camera to take some photos. They were all quite shy and agreed only if I brought them the photo prints. Deal. 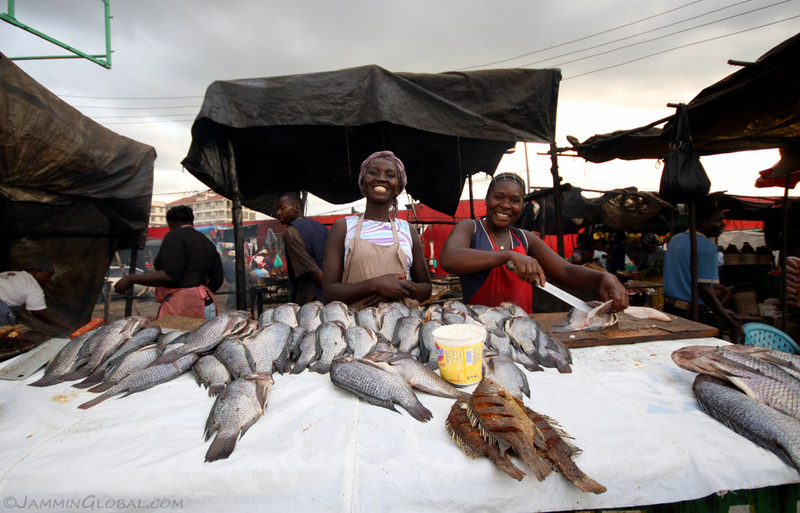 Smiley fish ladies, next to the vegetable stalls at Kenyatta Market. They were selling tilapias from Lake Victoria and it was the same price to buy them raw or deep-fried. They were even more happy when I brought them the print out of this photo. 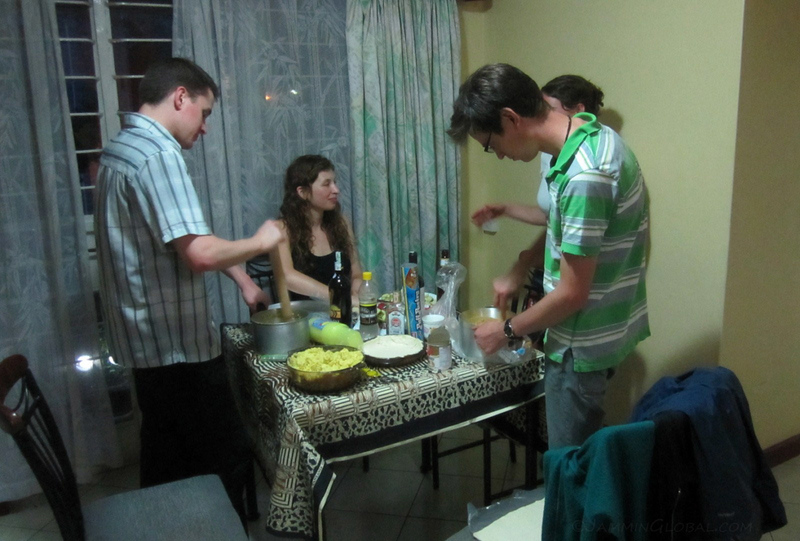 One thing I enjoyed about briefly settling down in Nairobi was the chance to cook on a regular basis. I usually made stir-fries or lentil curries. 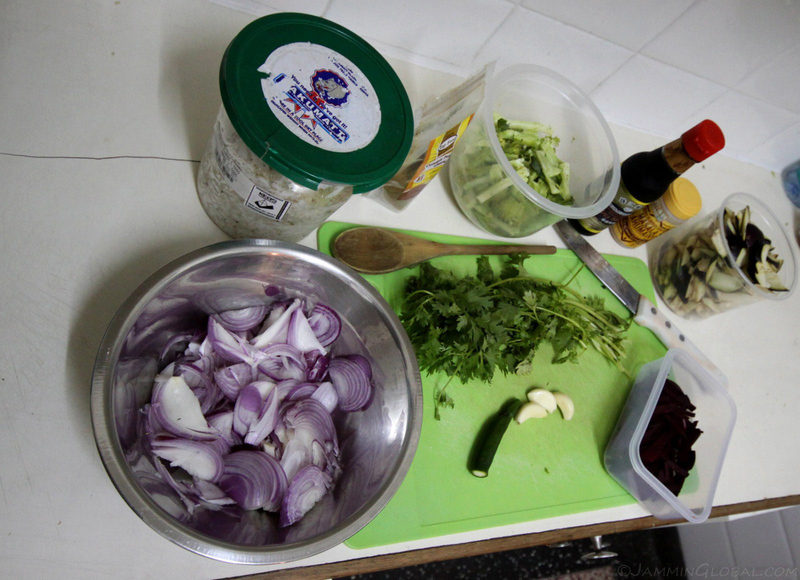 Here, I’m about to make a stir-fry with day-old rice, onions, garlic, green chilly, broccoli, brinjal and beetroot and seasoned with cumin, fresh cilantro, dark mushroom soy sauce and some smoked masala powder that I found near the hippy town of Bariloche in the Argentine Patagonia. 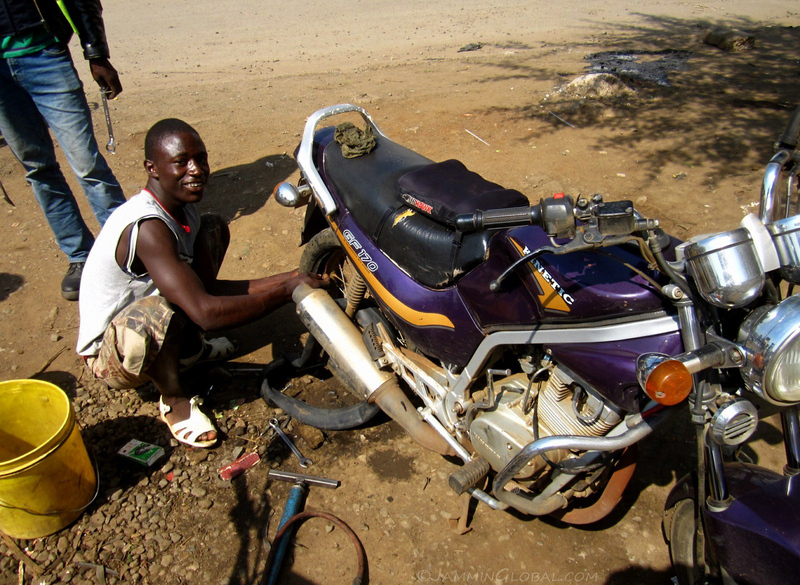 Getting a flat tire fixed on Lara at a boda-boda stand for Ksh100 ($1.08). 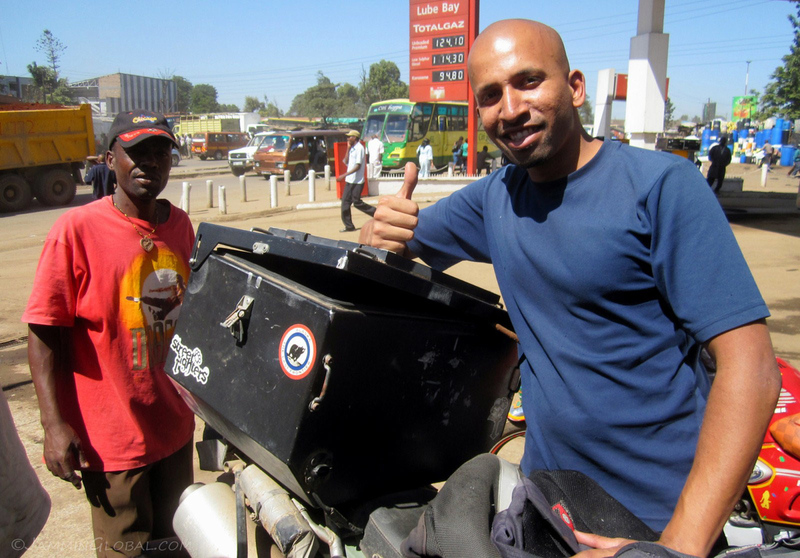 Boda-boda is the name for motorcycle taxis in Nairobi. I can fix a flat on sanDRina as I’m carrying all the tools required for that repair. On Lara, I wasn’t carrying any tools but didn’t really need to, since getting a flat fixed in a city is a simple task. Plus, it gives me a chance to interact with local motorcycle riders and see their culture. They love fitting radios with loud speakers on their boda-bodas. 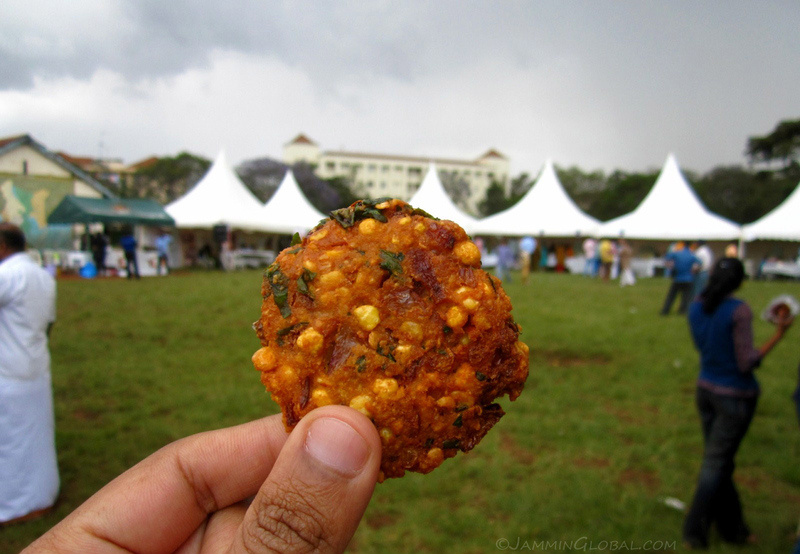 A masala vada at the annual Nairobi South Indian Food Festival. There’s a sizeable population of Indians in Kenya and they’re made up of those who came over generations ago (with the British) and those who’ve migrated recently as the economy booms along. My parents put me in touch with a family in Nairobi who originate from a place near to my parents’ villages outside Chennai. My South Indian hosts fed me excellent food at their home and brought me along for this fantastic food fest. I was surprised to see so many South Indians, as most Indians in Kenya are from the north. I had some super tasty Chicken 65 and these masala vadas (a deep-fried, spicy, chickpea patty, similar to falafel). 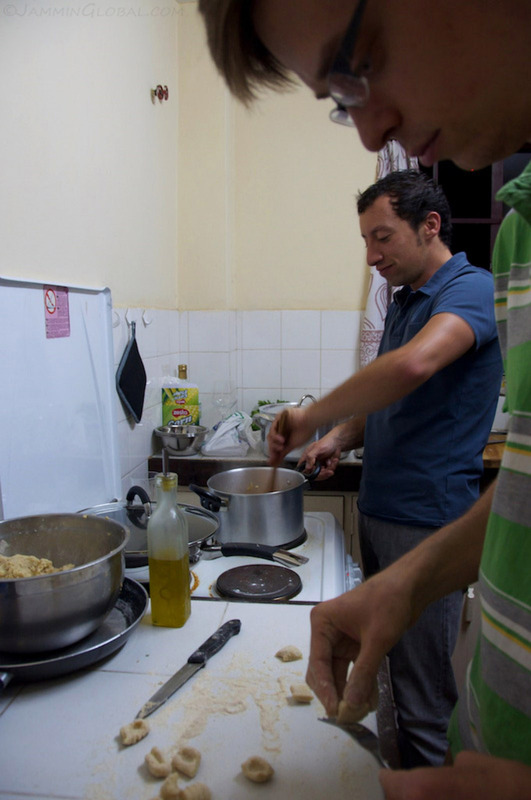 Richard, a Brit from my institute, preparing an Italian dinner at the house of an Italian, Davide. This was the birth of an idea known as Food without Borders, a simple but rich concept of taking turns and preparing food from a cuisine you know to share with other global citizens. At my CookSurfing dinner, I met Davide, a fellow CouchSurfer, geek and biker. He said he loves hosting dinner parties and asked me to prepare my chicken curry for a growing, mutual circle of friends. At that dinner, we noticed that most everyone was involved in research or international development and playing off the concept of Médecins Sans Frontières (Doctors without Borders), the idea of a group called Food without Borders slowly emerged. 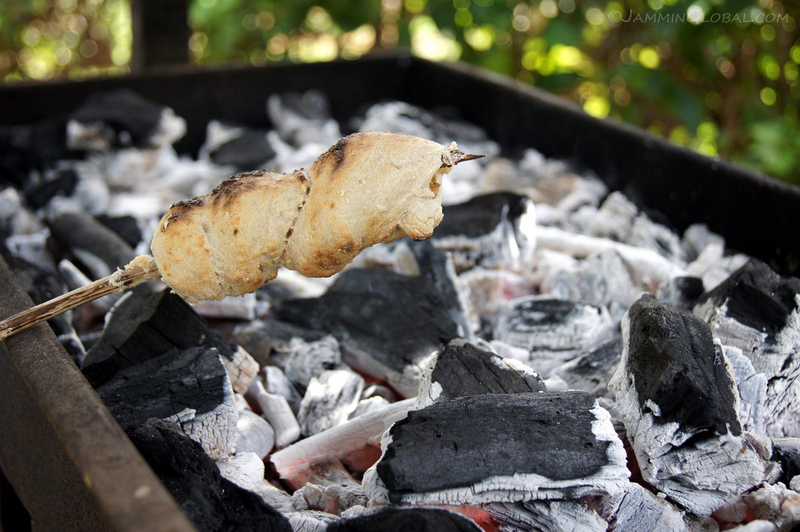 Richard offered to cook the first FwB dinner and having spent a considerable amount of time living on farm in southern Italy, he had picked up the cuisine and is making home-made gnocchi here. I always say the party’s in the kitchen. 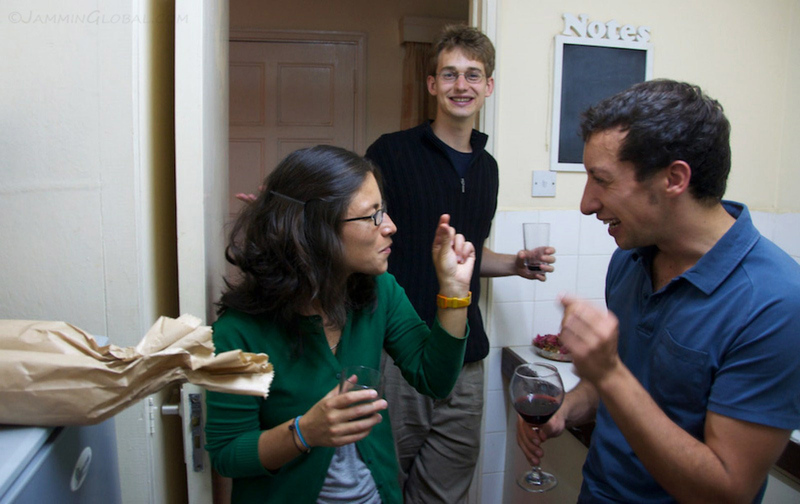 Davide and Diana sharing a joke, with Mica looking on. Diana is from Bogotá and leads the Africa office of a Latin American NGO focusing on disseminating development knowledge to those who can make a difference. She has lots of energy and is always super positive. I practiced my Spanish with her and was happy to keep in touch with it. 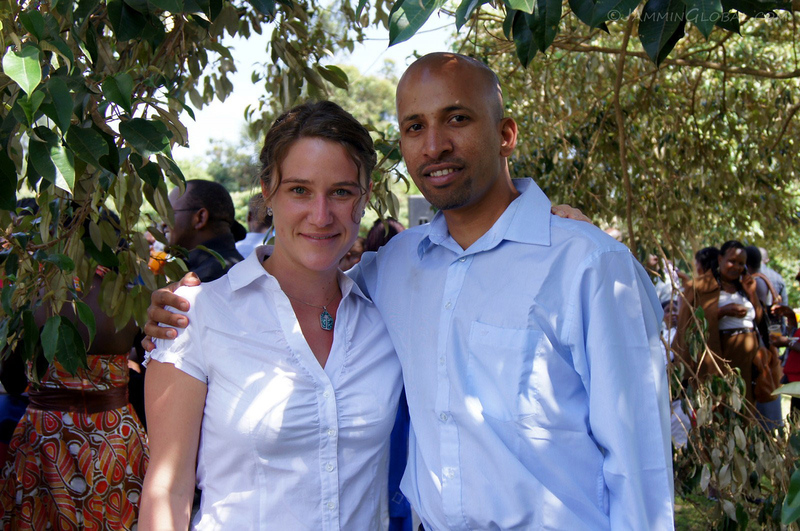 Mica is from the American East Coast and is the head of the Africa office of a British NGO focusing on climate change adaptation. He’s super tall, up for anything and a biker, too. Davide comes from a political science background and moved up through the UN system to become a knowledge management expert at UNEP (UN Environment Programme), which is headquarted in Nairobi. Dinner was almost ready and the boys are setting up the table while some new recruits to Food without Border enjoy bruschetta and shisha. Sarah is an Egyptian-American and is with UNEP and Laura, a Canadian, was at the World Agroforesty Centre, a sister institute to ICRISAT. …dinner. A delicious meal of tilapia in a vinegar sauce, prepared by Richard and a salad prepared by Jeremy, a Canadian also at the World Agroforesty Centre. 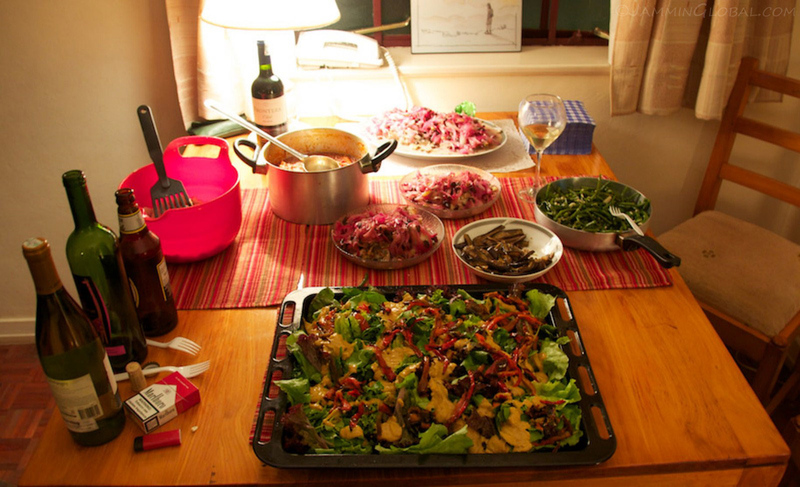 Our next Food without Borders dinner was American Thanksgiving at Sarah’s place. Everyone pitching in for the food prep. 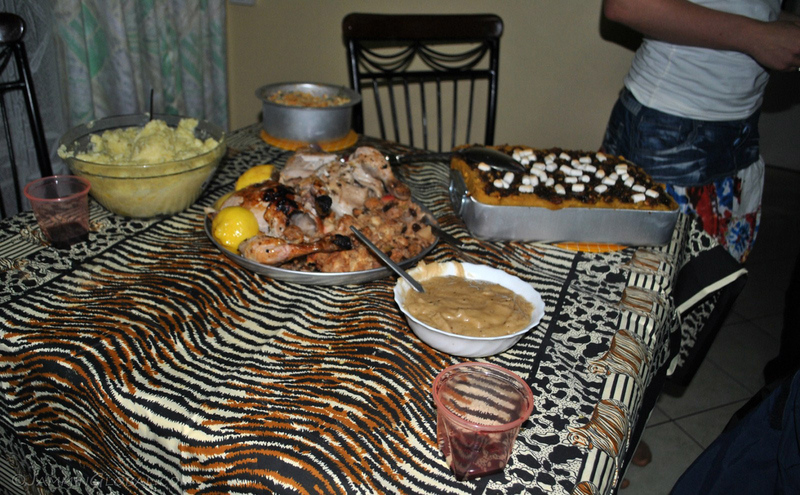 Turkey was really hard to find, but it was still Thanksgiving with a baked chicken, gravy, lots of stuffing, mashed potatoes and my favorite, sweet potato casserole with tonnes of brown sugar and topped with marshmellows. 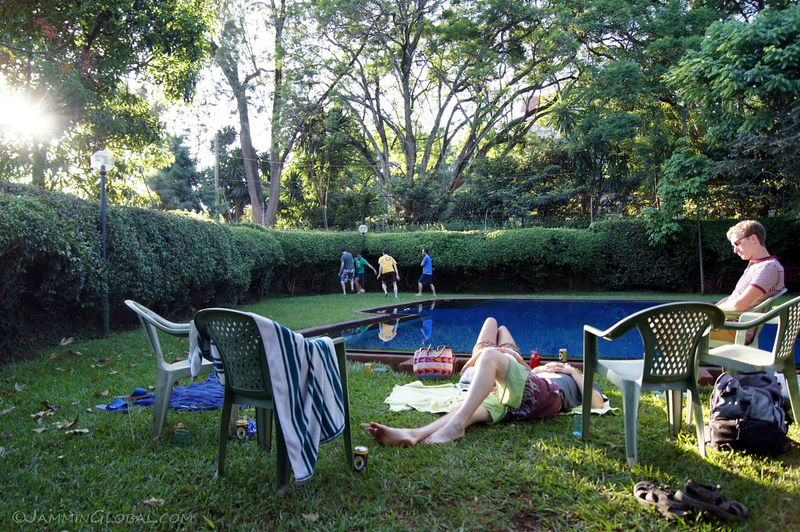 I stayed for a while with Bekcy Gitonga, whom I met through CouchSurfing and this was a typical view out the back of some Nairobi wildlife. 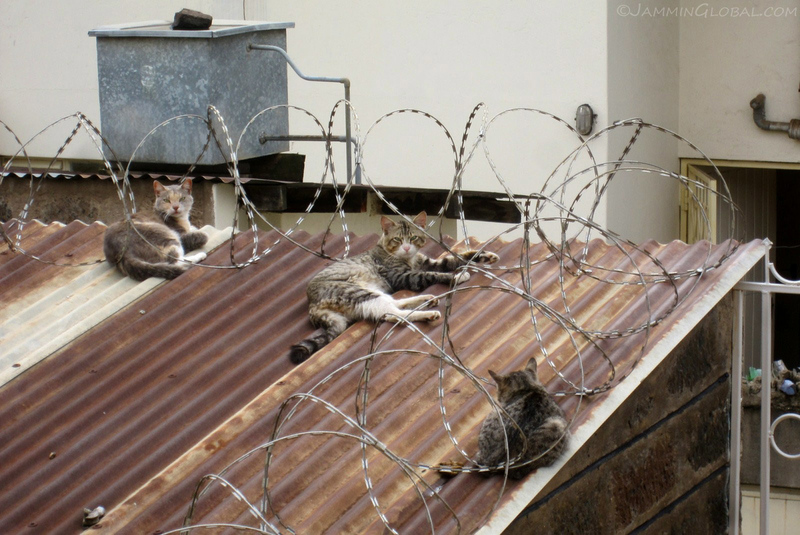 Those were some mean looking street cats and the strange thing was that they fought a lot with each other but found safety by staying inside these barbed-wire rolls. They’re snarling at me for taking this picture. 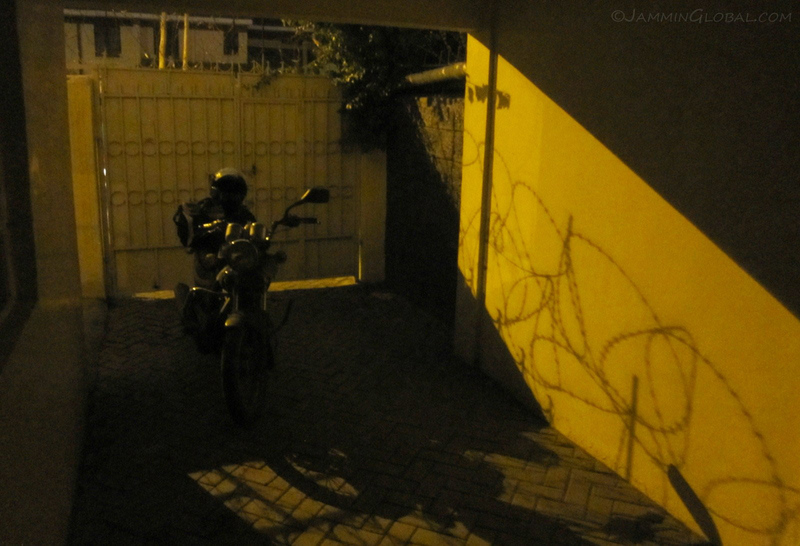 Lara, safely parked for the night inside a gated and barbed-wire secured compound. Nairobi is a big African city, with lots of developed areas and lots of impoverished areas and that inequality opens up opportunities for crime, which Nairobi is famous for, earning it the nickname of Nai-robbery. That fear prompts everyone, who can afford it, to live behind gates, barbed-wire and security guards. Having dinner at the home of friends of my sister. Soon after arriving in Nairobi, I contacted Shalini, standing on the left, and her sister, Leena, taking the photo, as they went to the same medical school as my sister in Manipal, on the west coast of India. 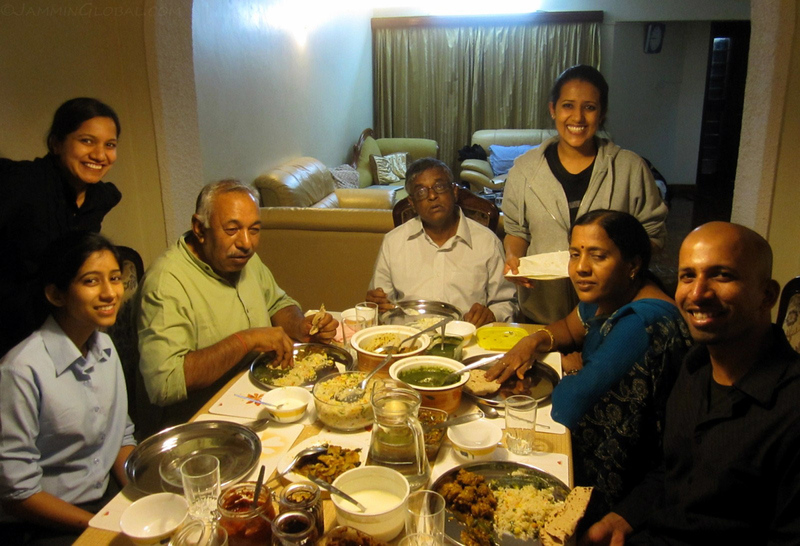 They regularly took me out for meals and invited me over for delicious home-cooked food. Nupur, sitting on the left, also went to Manipal for medicine, and Tina, standing on the right, is a cousin who lives next door and works in her family’s hospital in Nairobi West. Shalini and Leena’s father, in the green, immigrated in the 70s and set up a successful construction business. And the other two elders are Leena’s in-laws, who are visiting from Hyderabad. Aunty made some delicious South Indian food in a North Indian home. 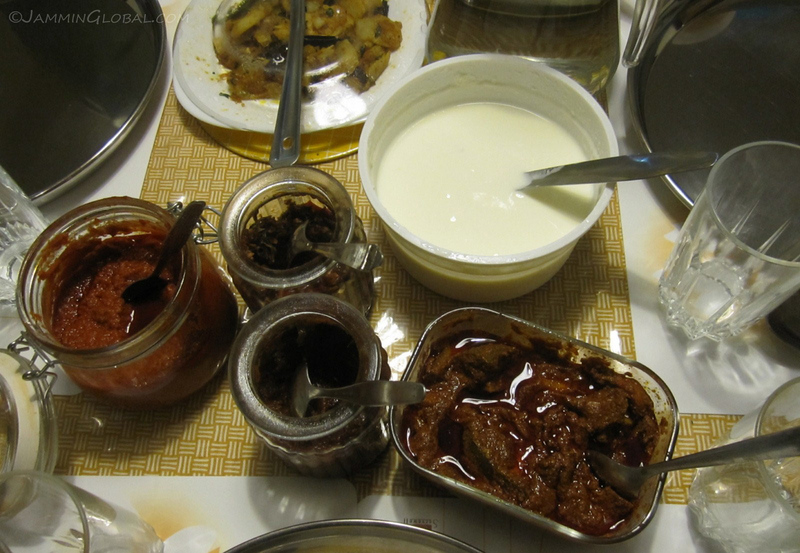 A variety of Indian pickles on the dinner table and the ever-present tub of curds (plain yoghurt) that goes perfect with spicy food. 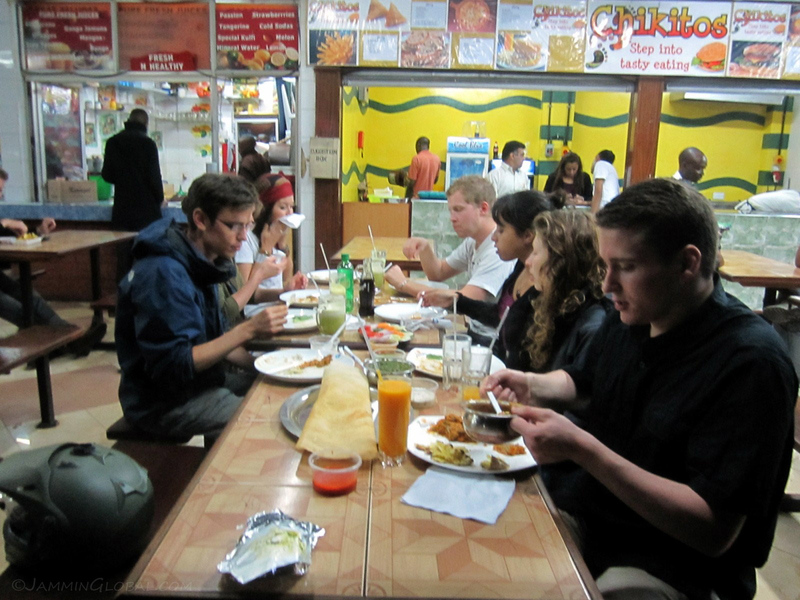 A bunch of wazungu (foreigners in Swahili) partaking in some Indian food at Nairobi’s Diamond Plaza food court. Indians are all over Nairobi but Diamond Plaza could be considered headquarters as it resembles being back in India the most. There was excellent food, like butter chicken and garlic naans, grocery shopping with Indian vegetables, like tindora, and shops selling sweet and savoury snacks. 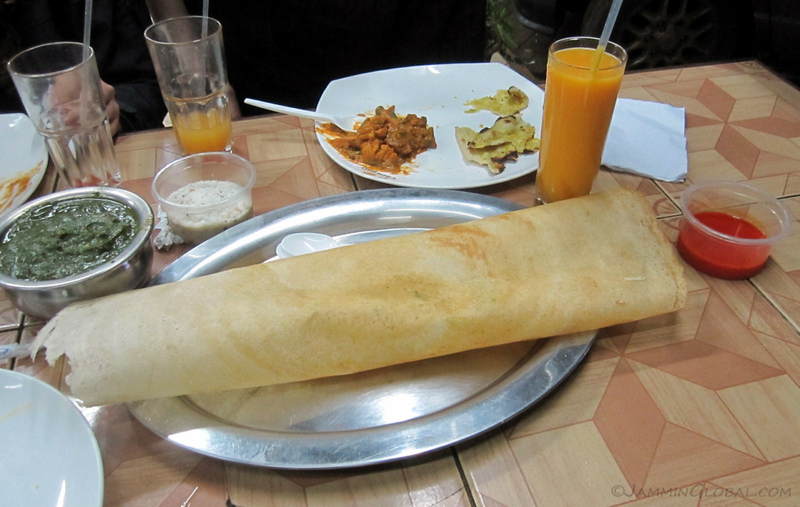 Enjoying my first dosa in Nairobi at Diamond Plaza. It’s one of the staple foods of my region and could be described as a crispy, rice crepe that’s eaten with sambar (lentil curry) and coconut chutney. This was a pretty pricey treat at Ksh500, but I soon discovered a place that was selling them for only Ksh200. Paying our waiter at the end of the meal. Just like the experience at nyama choma places, where competing waiters accost arriving customers to choose their restaurant to eat at, the myriad food stalls at Diamond Plaza send out their waiters to do battle and get customers to order from their stall. The food is almost identical at each stall and the prices are the same. I got fed up with this behavior and declared that the waiter who kept quiet and was polite would get our business and it happened to be this little guy. 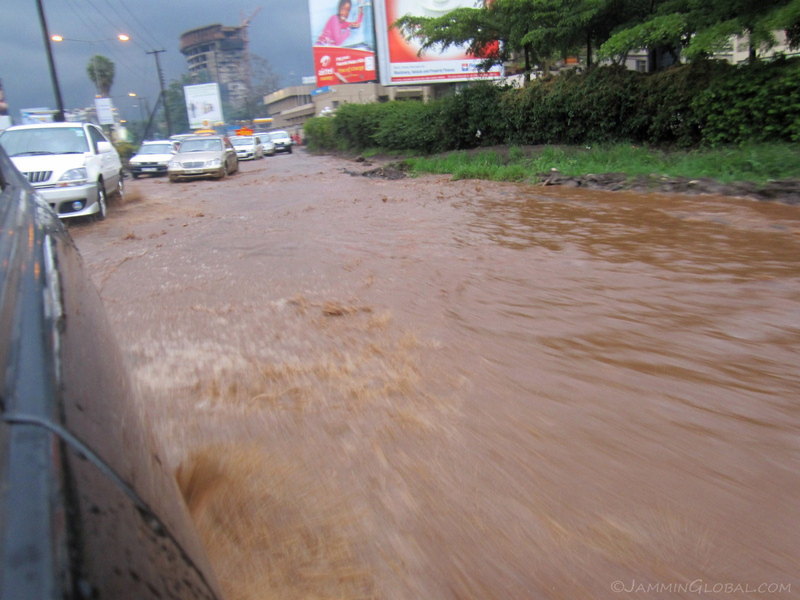 Ho hum, nothing to write home about, just a typical downpour and mini flood on Nairobi’s main highway. 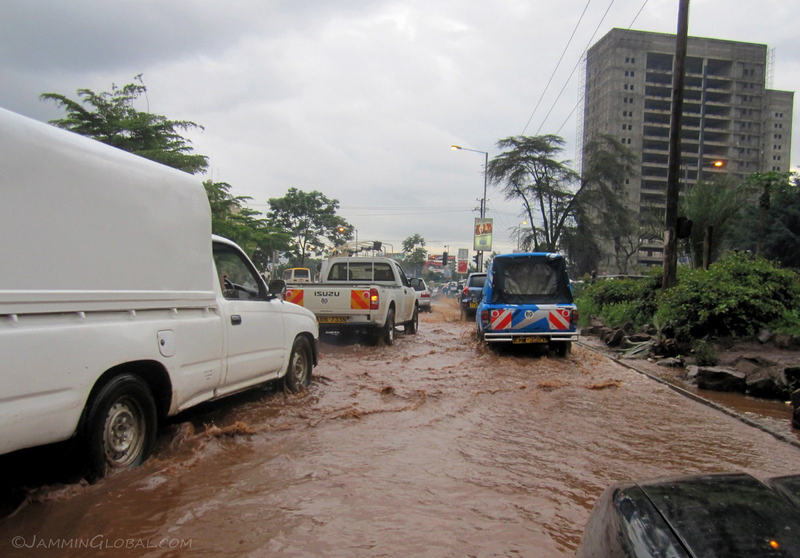 The rainy season had started and I got myself a pair of gum boots (rain boots) for riding in the rain and sanDRina was better equipped for Nairobi’s road floods than most of the cars. Good thing that the city is at elevation, around 1,800 m (5,900 ft) and is pretty hilly, as the water usually drains away quickly. When it rains, it pours! It’s a bit scary crossing water-covered roads as you never know where a huge pothole is lurking and the rains easily destroyed the roads around the city. There are two rainy seasons in Kenya, one called the short rains that falls from October to December and other called the long rains from March to May. The short rains were lighter in intensity but more constant and the long rains came in more proper tropical downpours with the sun soon coming out. A Food without Borders barbeque and Christina, a German girl from my institute and office mate, made these grilled dough boys. 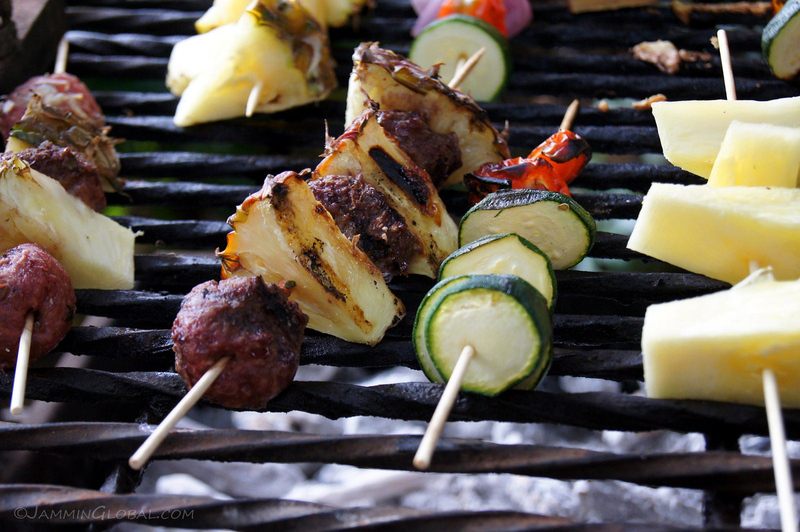 Skewers of meatballs and pineapple and zucchini and peppers. 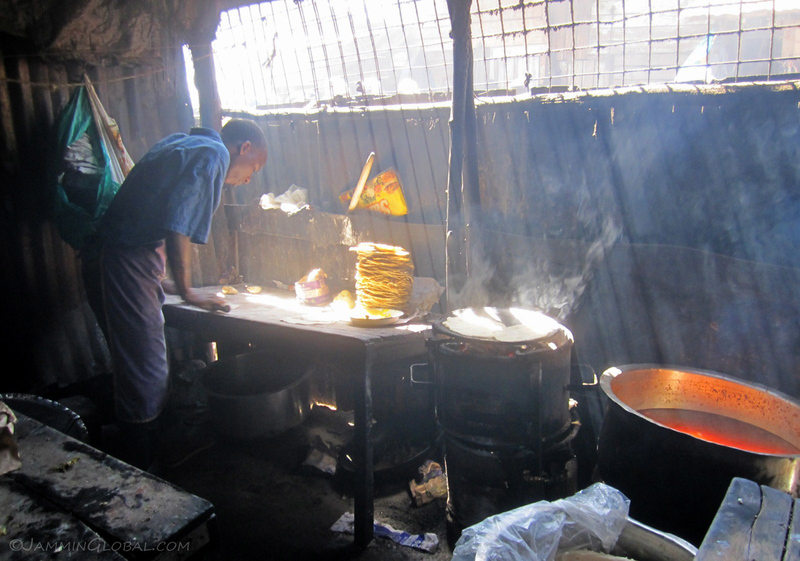 The kitchen at a small restaurant at Kariokor Market in Nairobi. Chapatis being stacked up in ready for the lunch rush hour. 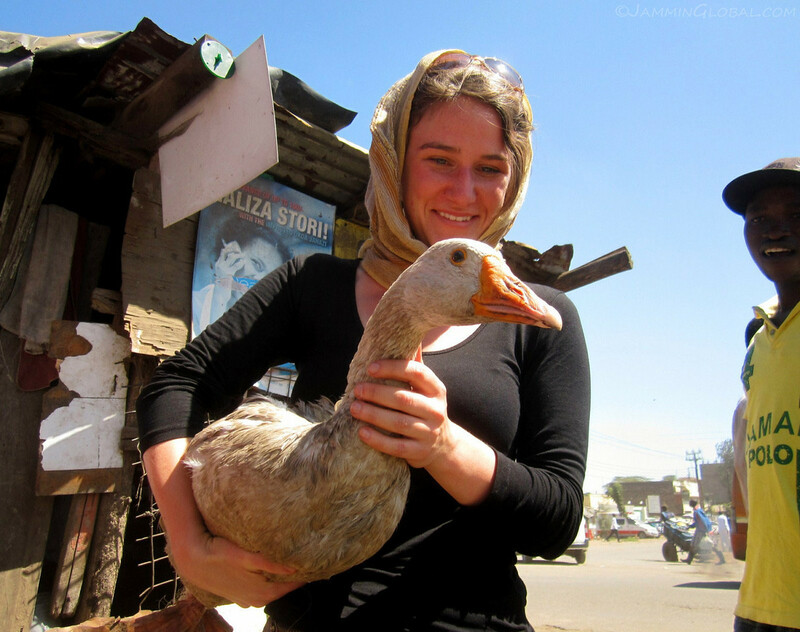 Christina and a goose that was slated to become our dinner. 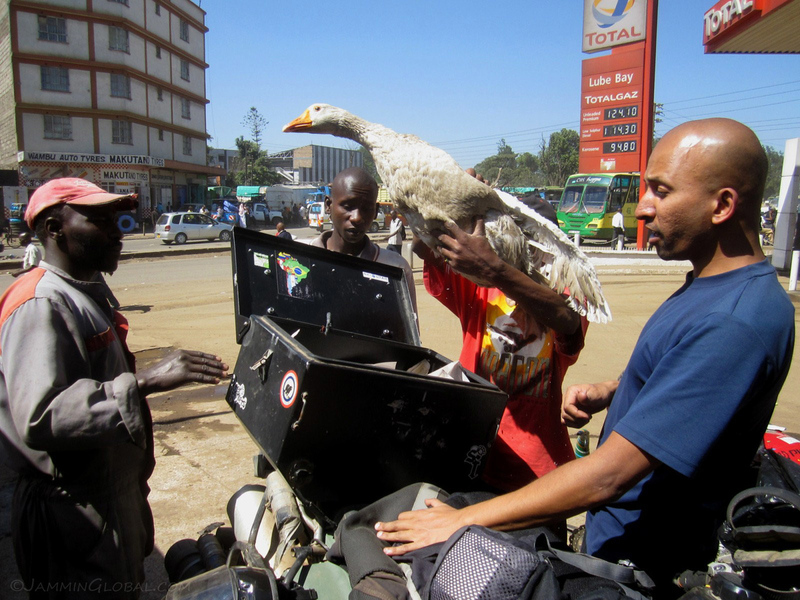 Christina said she wanted to prepare a typical German Christmas Dinner of roasted goose so I found out that geese can be bought at Kariokor Market. Hmm, it’s a live bird meaning that someone’s going to have to butcher it. I warned Christina not to get friendly with the goose; she wanted to give it a name. The goose went on quite a journey. 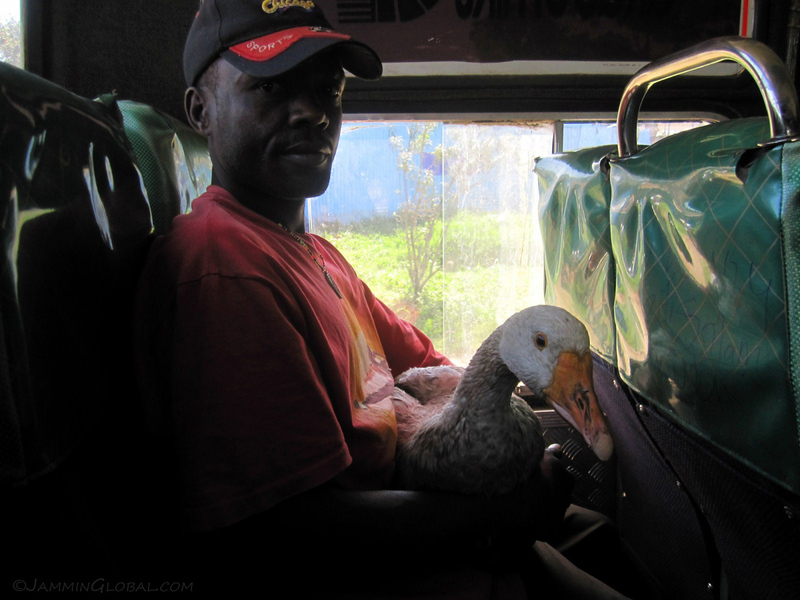 Here, a helper from a poultry shop, who helped us find the goose, is bringing her in a matatu (public bus). …and he’s safe for the ride. I cracked the lid open to allow air in. That Happy Trails top box is fantastic. It can fit a whole goose inside comfortably. 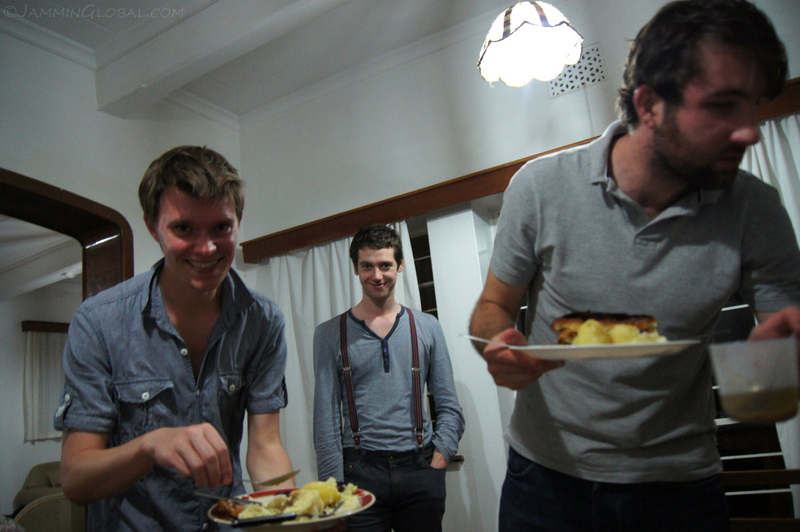 The dinner was going to be prepared at the guest house of the British Institute in East Africa. 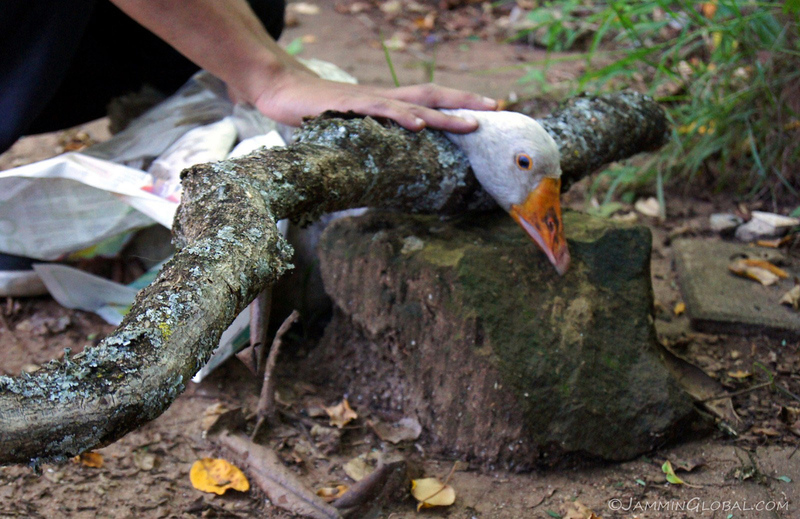 When the goose was put in the top box, its feet were tied but that came loose and as I took the goose out at the BIEA, he broke free. Godfrey and I ran after it and finally caught it. Another friend had offered to kill the bird, having had previous experience but then had to pull out at the last minute and the task fell on me. Having never killed an animal that I ate before, I was a bit nervous, but being a geek, I turned to YouTube for wisdom. I found a video from a permaculture farm in Australia on how to humanely slaughter a goose and applied some tips that I learnt. I told everyone around to be calm as the bird can sense the tension. I slowly stroked its head and laid it across this wood limb. Taking a practice from the Khoisan Bushmen of Botswana (that I saw in the movie The Gods Must be Crazy), I said a little prayer thanking the bird for providing us with this food and promised to treat it humanely and then the machete fell and its head was off. I used the newspaper to catch the blood spraying out and after a few minutes, the convulsions stopped and I breathed a sigh of relief at having just butchered my first animal that I would prepare and eat. 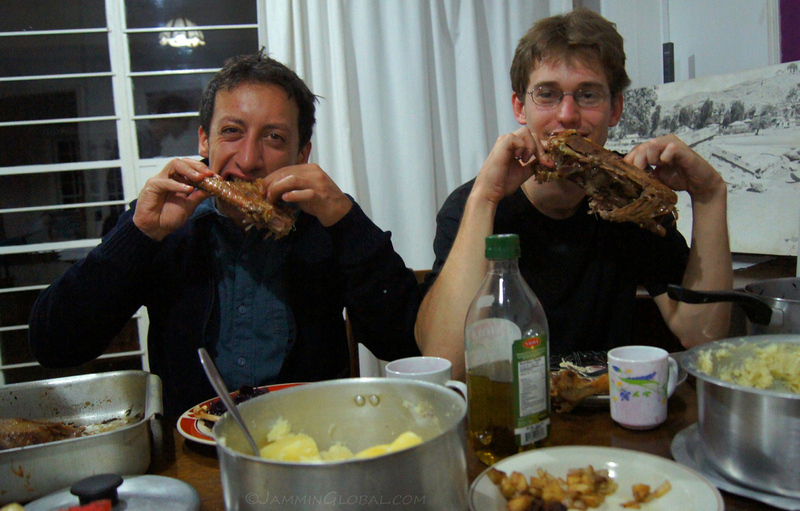 I was on a personal quest these past few years to get closer to my food and my stance on meat has been that if more people could come to terms with the fact that they are killing an animal when they eat meat, perhaps there would be fewer meat-eaters on this planet, which would greatly reduce our carbon and water footprint. I’m not against eating meat, but I think a reduction in global consumption is in order. Video of the goose slaugther. Warning: Animal Beheading at 1:10 and 1:23!! Not Safe for Vegetarians or the weak of heart! 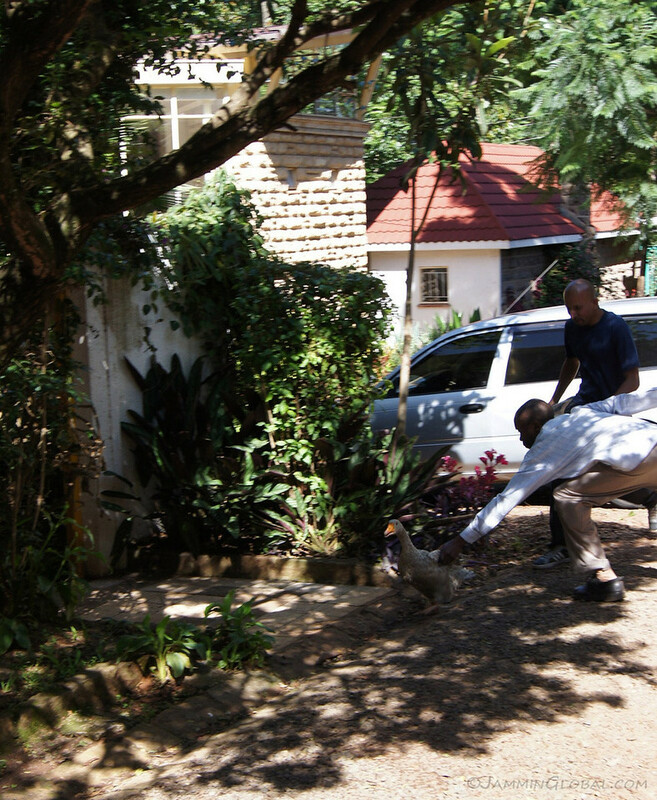 Then followed my first plucking of a feathered-bird with help from Chris and David, interns at the BIEA. It’s a slow process that provides an opportunity to chat and tell stories and get close to this animal that we just butchered. After about two hours, all the feathers were off and then I made a cut in its lower back, fed my hand under its spinal cord and pulled out all the internal organs. After cleaning the bird thoroughly, Christina seasoned it and roasted it in the oven for about 3 hours. And voila! 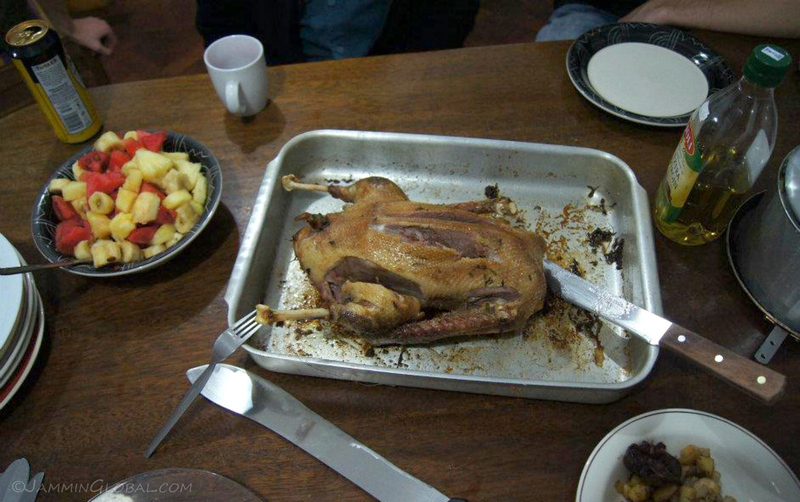 A roasted German Christmas Goose Dinner. Christina said her mother was very proud of her. 3 Brits at the British Institute in East Africa: Chris, Pete and David. They’re all wearing gray… maybe in homage to British weather. 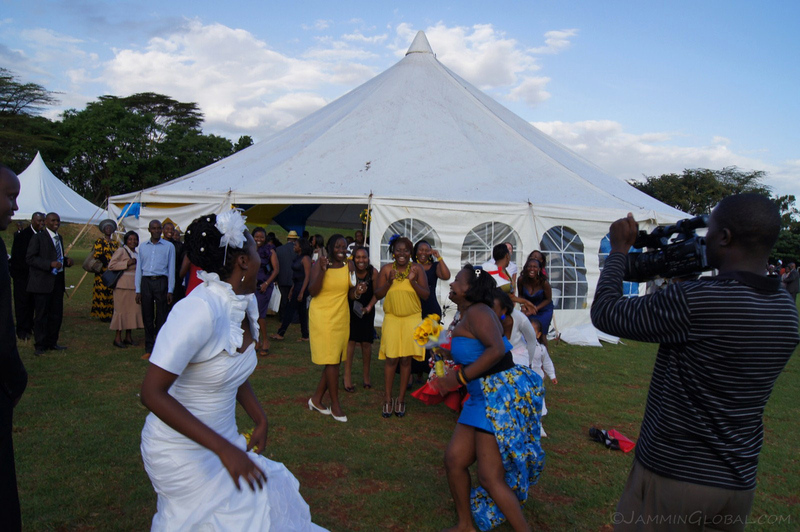 Christina and I were invited to the wedding of our other office mate, Christine Wangari. 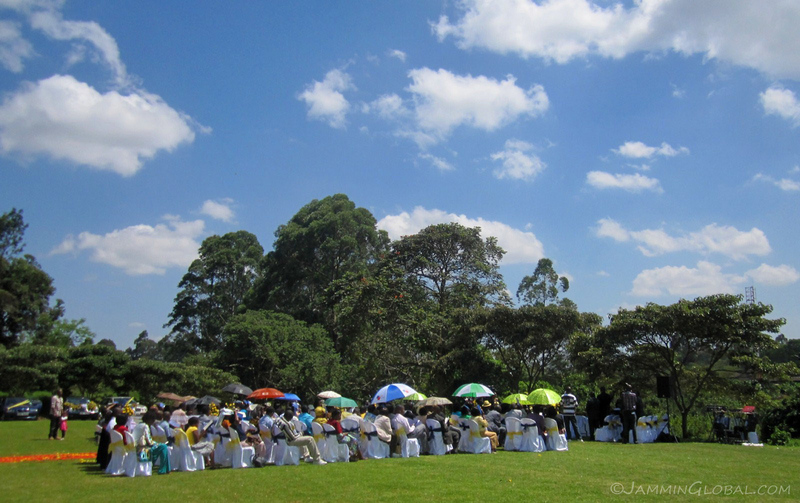 It was a beautiful ceremony held in the grounds of the UN Recreation Center on a bright day, just at the end of the rainy season. Budding agricultural researchers in Africa. Christina and I at the wedding. She’s doing her PhD at a university in northern Germany and came to Kenya with ICRISAT to conduct her fieldwork in western Kenya. The wedding was good fun and lots of music and dance was involved. 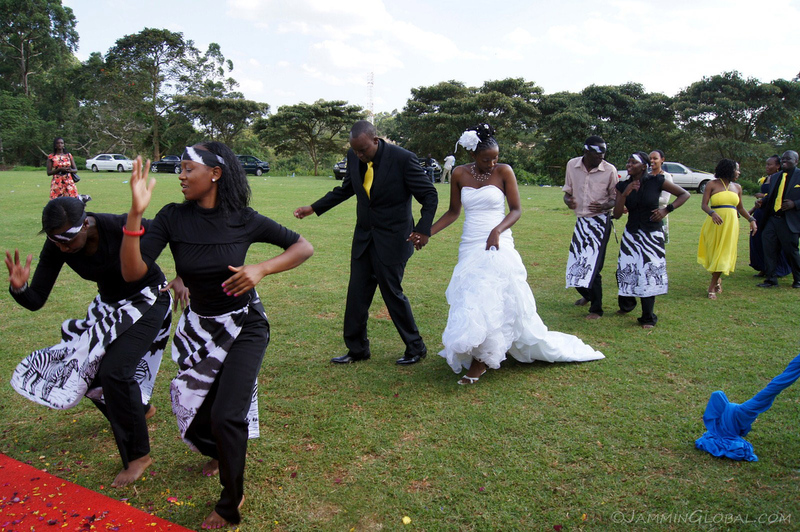 Here, the bride and groom are arriving, being led by a dance troupe into the wedding tent. 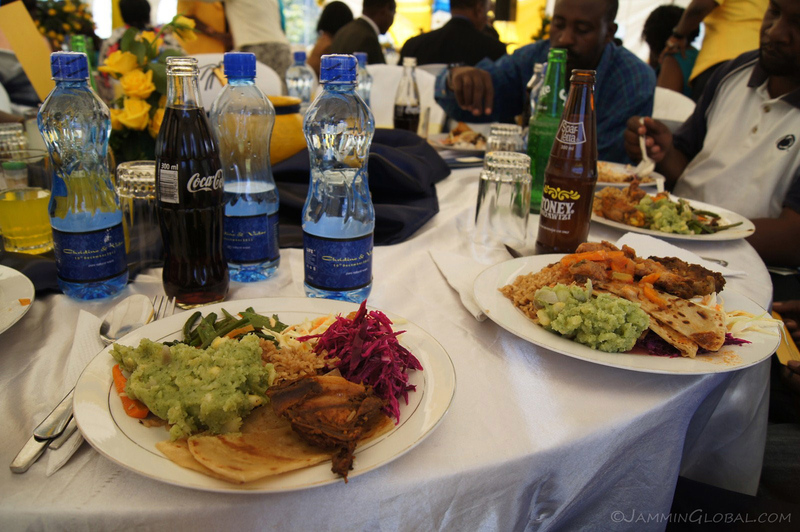 Food at the wedding of fried chicken, chapati, kinyegi (mashed potatoes with kale) and lots of other vegetables. The maid of honor caught the bouquet as Christine flung it over her back at the end of the ceremony. Christina was strategically standing at the back. Settling down in Nairobi gave me a chance to do things that I missed over this year and a half of being on the road, such as attending concerts. 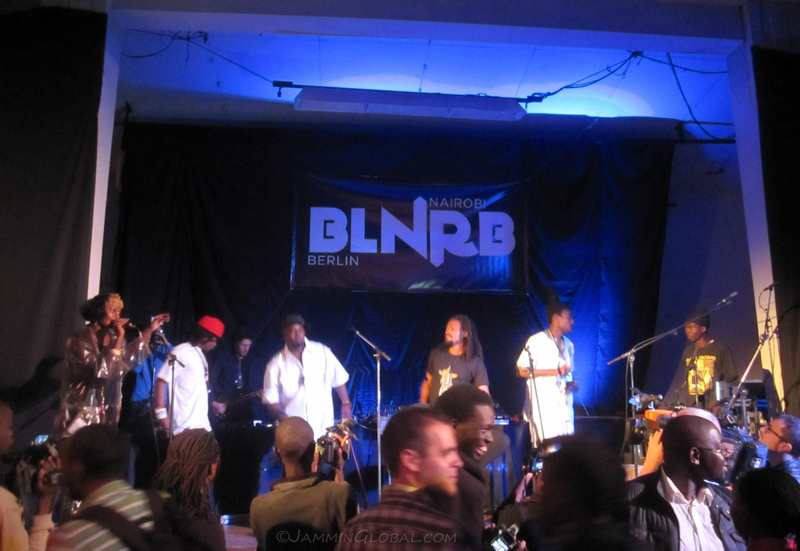 This was a performance by the project known as BLNRB-NRBLN, which is a collaboration between the Teichmann brothers in Berlin and the Goethe Institute in Nairobi that plays off each city’s electronic music talent. 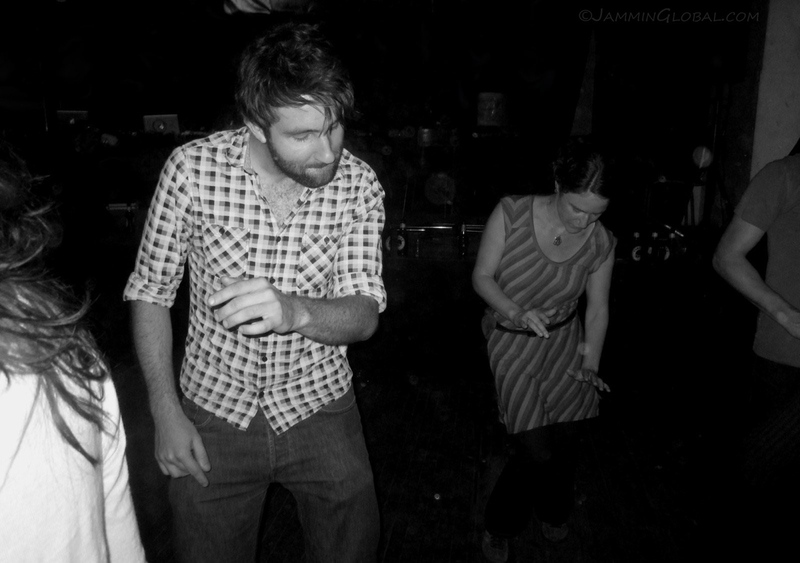 David and Christina caught in a dance moment. 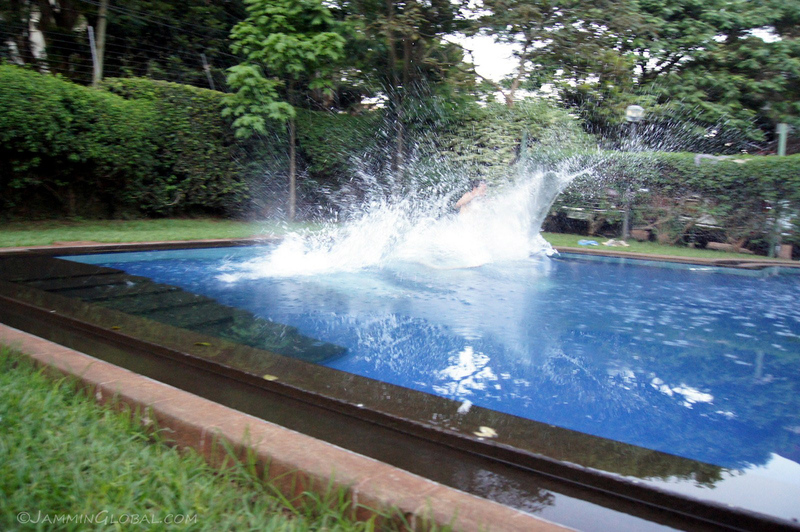 …making big splashes in the pool. Thanks. This was a nice glimpse of another part of the world I’ll likely never see in person.